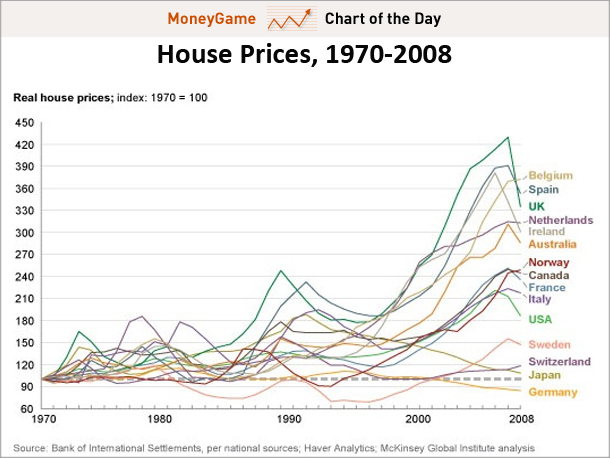 This chart shows the development of the house prices around the world. In Europe, Belgium, UK, Netherlands, Ireland and Norway had the highest increases in the house prices. Germany, Switzerland, Swden, Italy and France had the lowest increases. Outside Europe, Australia and Canada had relatively has relatively high house prices and relatively lower in Japans and the U.S. Especially notice 1995 when in many countries house prices started to rise dramatically.